Creation of an independent Ukrainian Orthodox Church is the aftermath of the systematic developments within eastern orthodox Christianity in Ukraine. 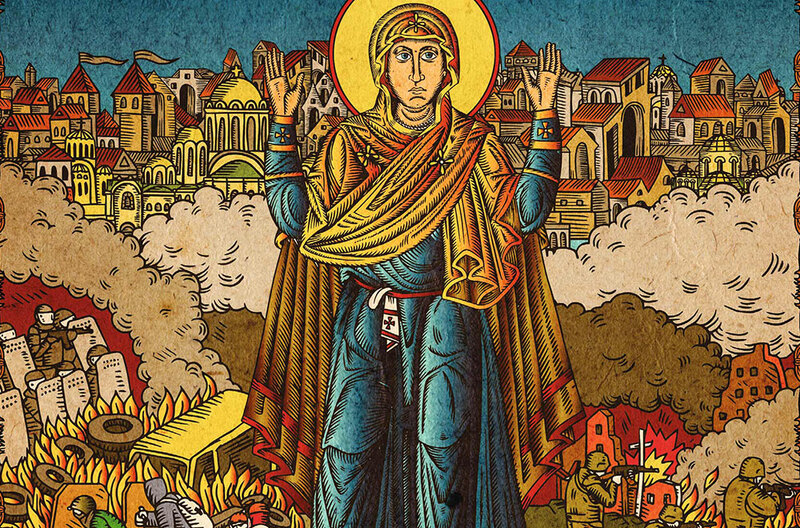 The recent announcement of autocephaly, or simply tomos, as it is known in Ukraine, has merely legitimised social and religious reality, which emerged as a result of complex historical events. Without doubt, the importance of the decision of Bartholomew, patriarch of Constantinople, for the religious affairs in Ukraine will be enormous. Its implications will, however, be much broader and will affect not only social, political, cultural spheres, but even, perhaps, the state security. Ukraine is a modern secular state, and yet religion and the Church play an important role in the life of the ordinary citizens – nearly 72% of Ukrainians consider themselves religious. Proportion of those, who received moderately religious upbringing is steadily increasing – while in 2000 only 31% of Ukrainians claimed they were brought up in accordance with their ‘faith’, this number rose to 40% in 2018. Surely, one can easily question the actual religiosity of Ukrainians. The number of people who routinely attend the mass is slightly lower than those, who declared themselves ‘religious’ – 52% and 72% respectively. Some 24% of Ukrainians attend the mass at least once a week, while 21% reported they only go to church once a month (Razumkov Centre, 2018). It is worth mentioning that as of September this year nearly 71.5% of Ukrainians indicated that they did not know what tomos was (KMIC, 2018). Nevertheless, the Church alongside the army and the voluntary movement remains one of the few social institutions, which are largely trusted by the population (61%, 57% and 65% respectively) (Razumkov Centre, 2018). Unsurprisingly, any major developments in the church affairs would have some inevitable repercussions for the entire country. In this particular case, the nature of these repercussions will be determined by Russia’s reaction and shifts in Russia’s strategy in its ‘hybrid war’ against Ukraine, rather than creation of the independent Ukrainian Orthodox Church itself. Over the past couple of months Moscow (or, in other words, Russian Orthodox Church’s authorities) has proven that it prefers escalation of the conflict to tactical compromises. Perhaps the reason behind it may be the amount time and efforts Russia has spent mentoring Ukrainian Orthodox Church of Moscow Patriarchate (UOC MP) to become a sole player in Ukrainian religious life. Needless to say, local Ukrainian pro-Russian elites happily embraced this initiative. During the presidency of Yanukovych, UOC MP has been given an unofficial status of ‘state church’, which, fortunately, has never become a written law, but has nevertheless been condoned by giving privileges on more than one occasion. Currently it is not unlikely that UOC MP will seek to destabilise situation in Ukraine. Being unable to pull Ukrainian Orthodox Church back into the Russkiy Mir sphere of influence, UOC MP will probably attempt to prevent Ukraine from moving away from Russia. Providing UOC MP becomes radicalised, there is a real possibility that this church will be headed by forces favouring ‘great Russian’ chauvinism fitted into the framework of outdated Russian love of Tsar, absurd fear of state-issued biometric IDs and other rather bizarre notions. This will ensure that the faithful flock stay loyal and ready to follow UOC MP’s leaders in any of their risky political endeavours. In fact, it has been a while since UOC MP has been gearing its churchgoers up for an upcoming ‘persecution’ by the ‘filaretists’, as they liked to call Ukrainian Orthodox Church of Kyiv Patriarchate (UOC KP). Pro-Russian politicians in Ukraine have immediately backed these fears – in July 2018 Volodymyr Novynskyy, Ukrainian MP of the ‘Opposition Block’ (which mostly consists of the former members of the Party of Regions) claimed that if Ukraine eventually receives tomosit will lead to a religious war in the country. It is unclear whether any mass protests will occur as a result of Istanbul’s October decision, but, understandably, this option should not be dismissed. If this happens, Moscow will have a picturesque proof of ‘religious persecution in Ukraine’ in its hands, which will be promptly used in order to slander Ukraine in front of its western allies, strengthen anti-Ukrainian sentiments in Russia and legitimise Putin’s role not only as a ‘unifier of the Russian historical territories’, but also as a ‘saviour of the canonical Orthodox Christian faith’. However, should this happen, it will only further marginalise the role of UOC MP. UOC MP’s influence has already been decreasing. From 2008 until 2018 the number of Ukrainians, who stated that they attend churches led by UOC KP has been on increase, rising from 12% to 29%. Meanwhile, the number of Ukrainian adherents of UOC MP reached its height in 2010 rising to 23.6%, and then fell to its current 13%. In the aforementioned period the number of people, who declared themselves as ‘simply orthodox’, not specifying whether they attend UOC MP or UOC KP, decreased from 38.6% to 23.4% (Razumkov Centre). This process has accelerated after 2014, when Moscow began using UOC MP to justify its military aggression against Ukraine. Occupation of Ukrainian territories has also partially affected statistical data, however Ukrainian Ministry of Culture reported that nearly 120 religious congregations have already left UOC MP. Religious Information Service of Ukraine reported slightly lower quote of 70 congregations, however, the sole fact, that UOC MP is losing its parishioners, remains unchallenged. Now, after establishment of independent Ukrainian Orthodox Church, this tendency will likely continue and as a result UOC MP’s influence will be limited to a local level in southern and eastern regions. At the same time, Moscow’s bitter reaction to creation of independent Ukrainian Orthodox Church has, in fact, assisted Ukraine in its efforts to eradicate local structures of ‘Russian world’ in the country, which were linked to UOC MP in one way or another. These include highly branched out network of pro-Russian institutions affiliated with UOC MP, be it voluntary civil organisations or paramilitary units, which were operating disguised as private security firms. The well-known incident, that took place in January this year, when members of the “Orthodox Union Radomyr” [Affiliated with UOC MP – Ed.] assaulted civil activists from Zaporizhzhya, seems to only prove the facts mentioned above. After Security Service of Ukraine (SBU) raided and searched the premises of “Orthodox Union Radomyr”, authorities discovered that this organisation had at its disposal not only propagandist Russian materials, but also firearms and other weapons. Few years back, when UOC MP still maintained its privileges and had an influential lobby in the previous Ukrainian government, such searches and security measures were understandably unrealistic. But presently SBU can even choose to work directly with priests. For example, in early December this year twelve priests were summoned for questioning in Rivne. Furthermore, Ukrainian state could even consider taking certain strategic steps that would ultimately lead to an outright abolition of UOC MP in Ukraine. For instance, in November Ministry of Justice of Ukraine invalidated the previous transfer of Pochayiv Lavra to UOC MP. Pochayiv Lavra, a historic church complex in the west of Ukraine, has been righteously believed by many to be the stronghold of Russian influence in the Ukrainian region of Galychyna. As it happens, the government’s has been well-grounded indeed – in 2015 journalists gathered an evidence that Pochayiv Lavra’s priests have been selling and printing pro-Russian propaganda. Hence, after establishment of independent Ukrainian Orthodox Church, the sweeping de-russification of Ukrainian religious space may potentially accelerate. In a short-term perspective, it may lead to inter-church and civil conflicts, which will in turn become another element in Russia’s hybrid war against Ukraine. It is very likely that before the year ends, Russian media will start circulating frightening fakes, albeit this time instead of ‘crucified boys’ Russian news channels will probably feature monks or priests. It is unlikely that Moscow will succeed in its efforts to convince the West in the existence of Ukrainian ‘religious war’, just as it had previously failed to force on its theory of ‘civil war’ in Ukraine. In fact, tomos has been as essential for Ukraine’s efforts to preserve its Orthodox Church from Russian interference, as the fall of Yanukovych. Moscow may and will cause a lot of troubles using UOC MP as its tool in Ukraine, however from the historic point of view, for Russia it is currently too late to lock the stable-door when the horse has bolted. The more aggressive Russia becomes in its efforts to lock the stable-door, the quicker UOC MP will become a radical, but largely marginalised opposition to an independent Ukrainian Orthodox Church. Additionally, now that the canonical status of UOC MP is rather ambiguous, its political toxicity will increase proportionally to its radicalisation. Ukrainian politicians, undeniably, are not particularly picky in their choices, but after a while public manifestation of ‘friendship’ with UOC MP will do more harm than good. Nonetheless, this does not mean that the future of the independent church is set, and it’s even less likely that it will be painless. The new church will have to compete for approval and acceptance among Ukrainian orthodox churchgoers. Most importantly, independent Ukrainian Orthodox Church will have to prove to society that its establishment wasn’t just a simple political move on the eve of elections, an empty formality or a consequence of perplexing geopolitical games. Why? Because in October this year 54% of Ukrainians reacted positively to the creation of an independent church, while only 19% said it was a negative development, and 19% of respondents did not care (Sociological group ‘Rating’, 2018). And this result can equally be improved or impaired. Undoubtedly, more than few Ukrainian politicians may attempt to compensate their volatile popularity at the expense of the new church. However, Ukrainian society will hardly accept it if the distance between the state and the Church suddenly shrinks. Only 34% of Ukrainians support the idea of ‘national orientation’ for the church, and only 47% out of the UOC KP churchgoers supported this thesis. 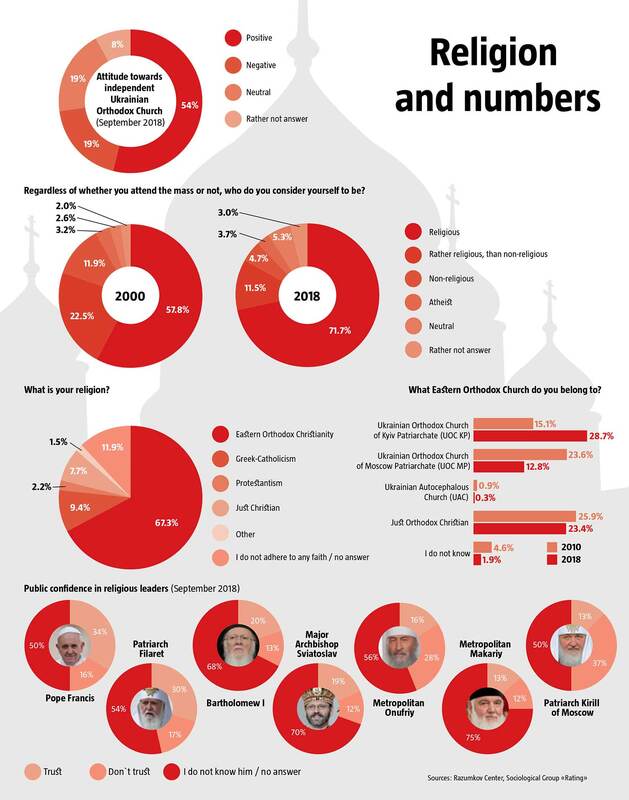 Furthermore, barely 12% of Ukrainians endorsed the possibility of the formation of ‘state Church’ (Razumkov Centre, 2018). And yet, to gain a social popularity it won’t be enough to keep the distance with the state. The popularity has to be earned. While 61% of Ukrainians trust the Church, only 45% of those, who responded, agreed that it has a moral authority in society. Over the past eight years this number has fallen by 11% (Razumkov Centre, 2018). It will also be hardly possible to retain the popularity based on historic victory over UOC MP or using the patriotic rhetoric. Success of the independent Ukrainian Orthodox Church will rest on its ability to respond to changes and improve its communication with various social groups. However, this depends on whether authorities of the new church will go along with their historical mission and whether they are willing to implement it.